Apple's Keynote + Uncomfortable Doctrinal Statements = Youth Group Fun! Here are my Helvetica-font slides from my latest talk at Saint Anthony of Padua Catholic Church. Topic was on understanding the place of those Outside the Church and all that the Catechism and Scripture has to say about the matter. I also got to talk about Hell. Good times in youth group! Here is my second post on the interrelationship between community and evangelization. If you have not read the post on community, go and do so now. It will blow your mind. Or, it will prepare you for this article, at least. I have about 15 articles on this website about evangelization. You can check those out to get a bigger picture of my views on evangelization and what it is all about, but for now, I am going to paint for you a quick portrait of evangelization in order to hasten the point of this most excellent blog series. 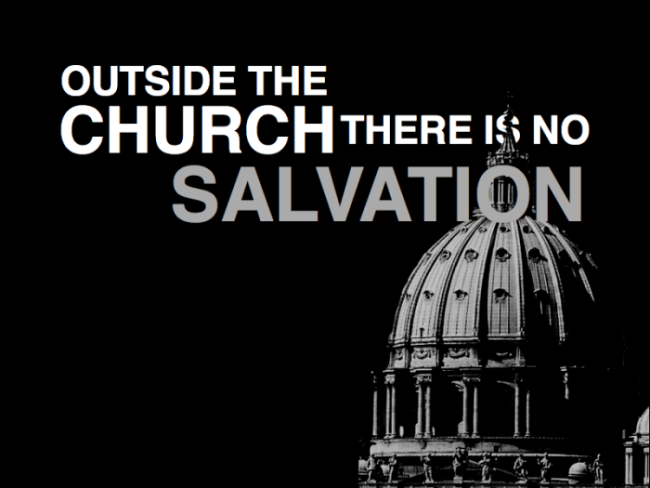 First, evangelization is the whole work of the Church, starting from grace and ending in glory. It is also a work of the whole Church, not left up to the priests on the altar, the monks in foreign lands, or the nuns in the inner-city Catholic schools. It is just as much your responsibility as it is mine, and I have a fancy website! So this means that evangelization is why the Church exists, how the Church continues to exist, and is the reason for our existence within the Church. My New Little Series on Evangelization and Community. I've been thinking lately about two things: evangelization and community, and how they are inter-related. Here's some posts that will follow along these thoughts as I have them. As always, any series that I do are sporadic and incomplete. They are intimations and suggestions towards answers, not the answers themselves. Most of my ministry is devoted to the cause of the new evangelization. I am trying to get a sense of where the Spirit is moving the Church today, of how He is transforming things like parish ministries, outreach, the marginalized and forgotten, the active and the devout. The new evangelization seems to suit me because I enjoy the idea of reaching out to Catholics who aren't really all that Catholic. The Mission Ad Gentes is too remote and I'll leave it to better, smarter, holier people to do authentic mystogogy. Community is more difficult for me because I am a nerd and a bit of a loner when it comes to ministry stuff. Heck, this whole website is somewhat of a testament to that - it's just me typing away in my makeshift office all alone. But community is important, and so I need to focus my energy on developing a sane and helpful approach towards "fostering the Christian community", whatever that means.